It’s so nice to have everything organized in my studio now, so much easier to have everything in one place instead of scattered around the house. 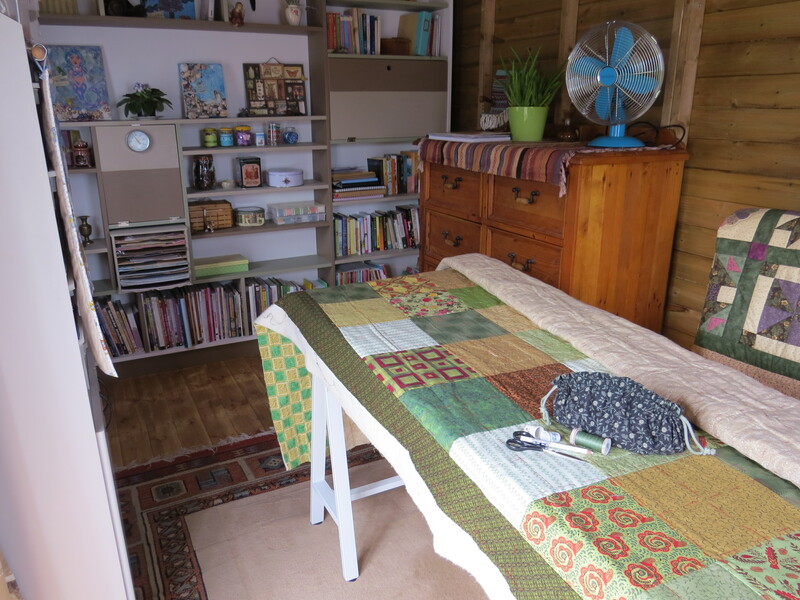 With the birds singing outside and sunshine flooding the room, it really is a pleasant place to work and play. 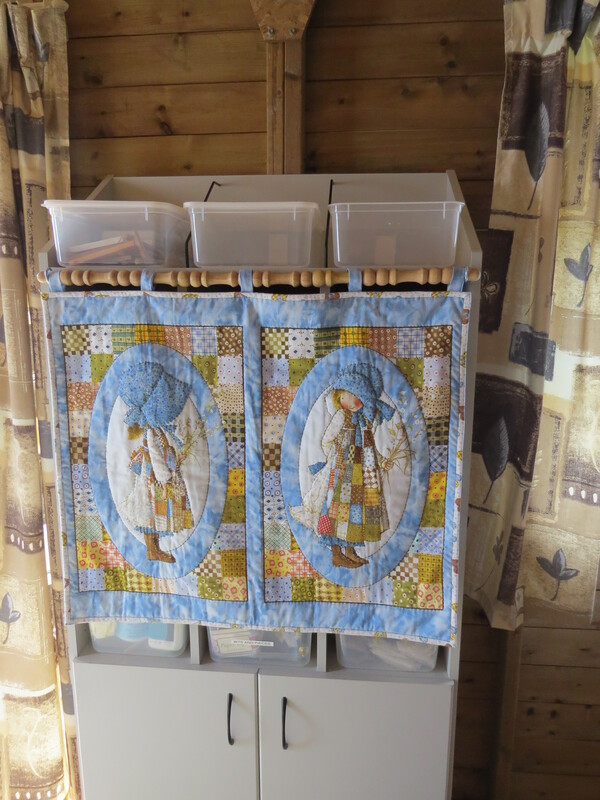 The Holly Hobbie quilt hangs over the front of the cabinet, hiding the boxes of craft supplies. 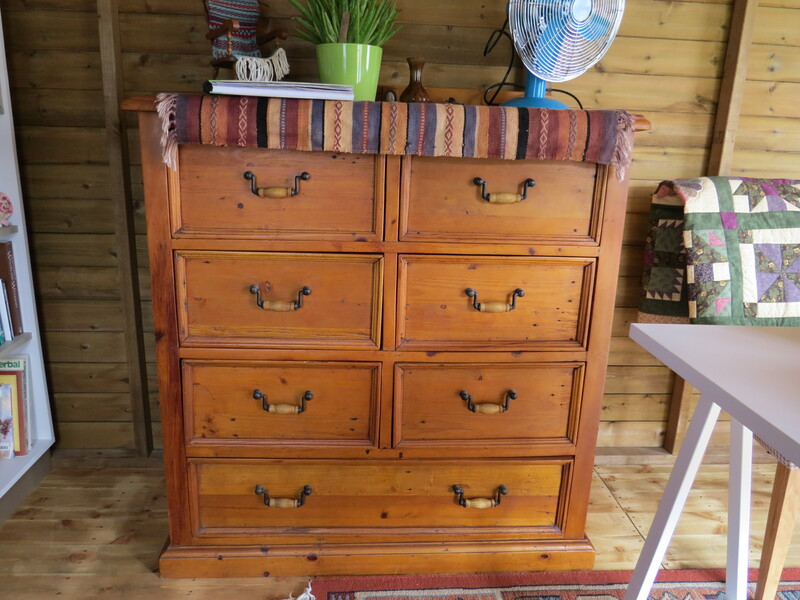 This chest of drawers, already full of crafting paraphernalia, was shifted from the house out to the studio. 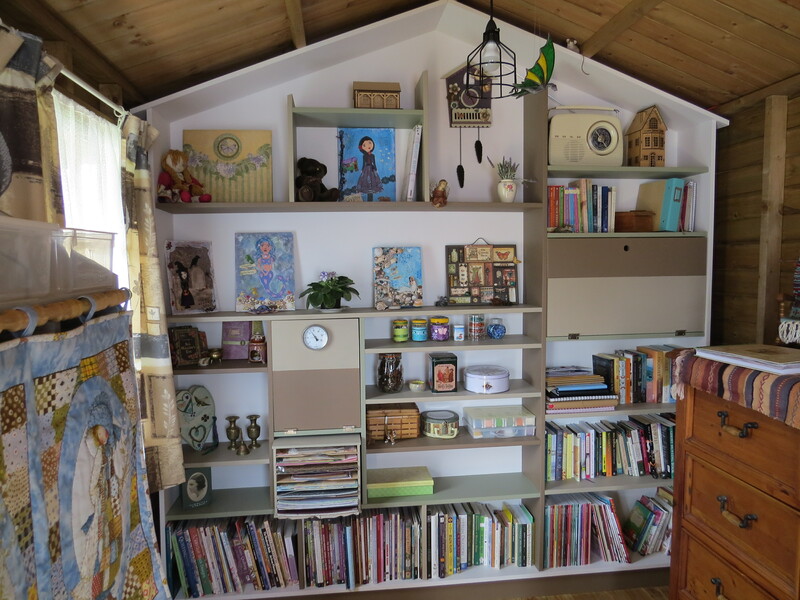 The shelves that Nick built hold my books, journals and magazines, art projects, seeds, jars of buttons and beads, scrapbook papers, and knick knacks. 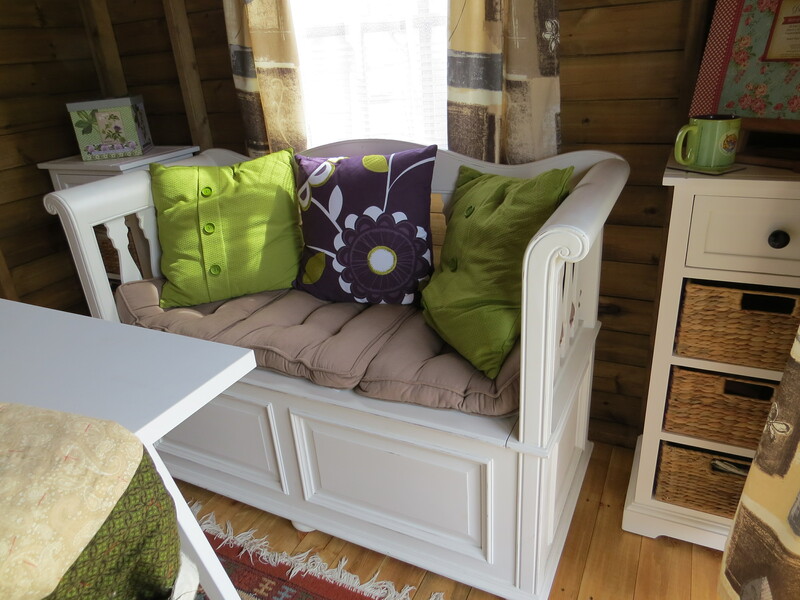 A small seating area for relaxing and for writing. The seat lifts up to provide handy storage underneath. 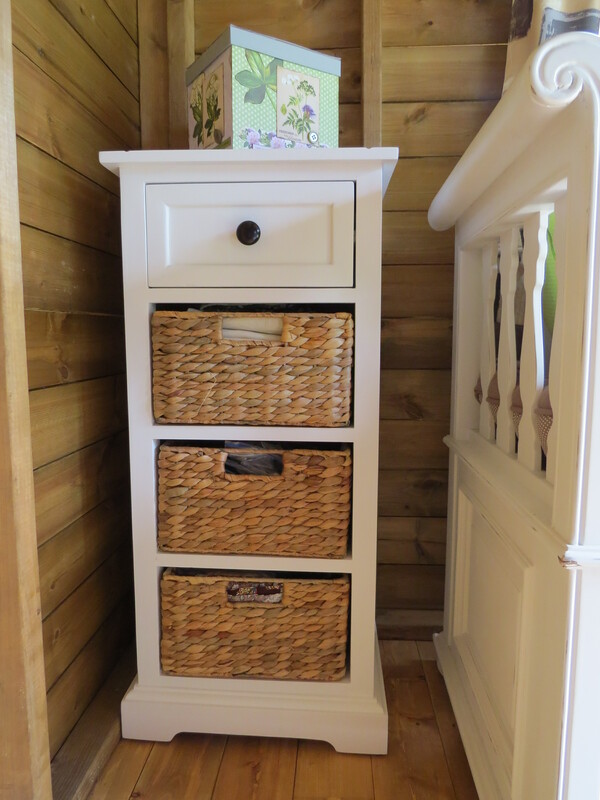 The country style cabinets at either side came from Storage Box. They fit in the space perfectly. The baskets are made from water hyacinth and are great for keeping fabrics in. This is my latest work in progress, a new quilt I am making for our bed. 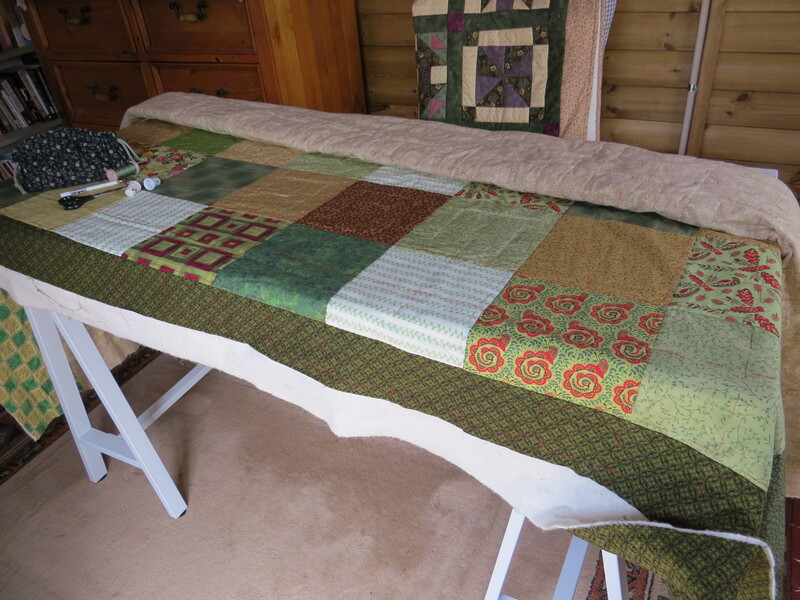 It is a simple design of patchwork squares in colours of greens and browns. I just have to finish quilting the top and then sew on the binding. 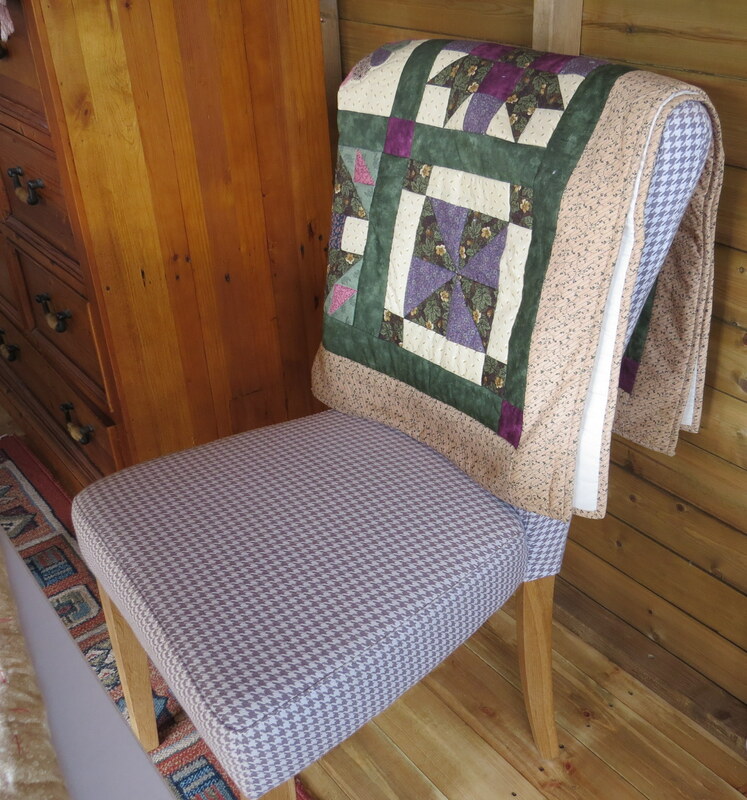 The quilt draped over the back of the chair was the first one I ever made, at a beginner’s class I went to about ten years ago. I like to listen to the radio while I am crafting. 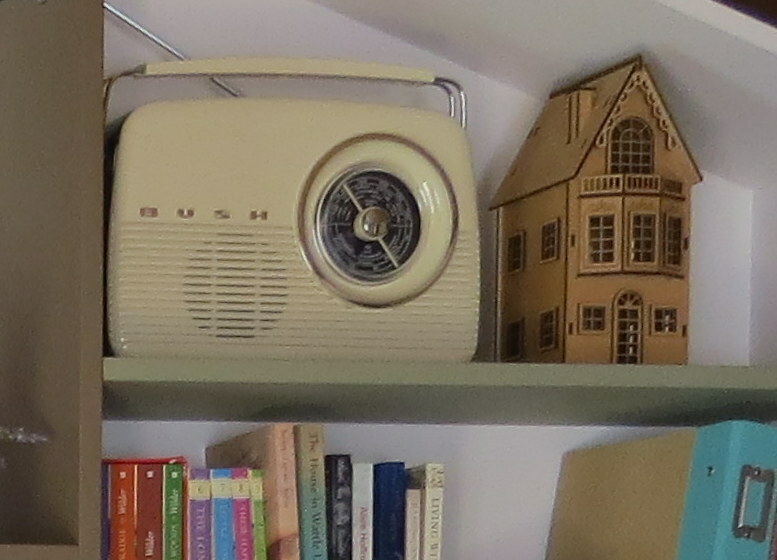 Magic FM is my favourite radio station, which plays songs from the 60s, 70s and 80s. 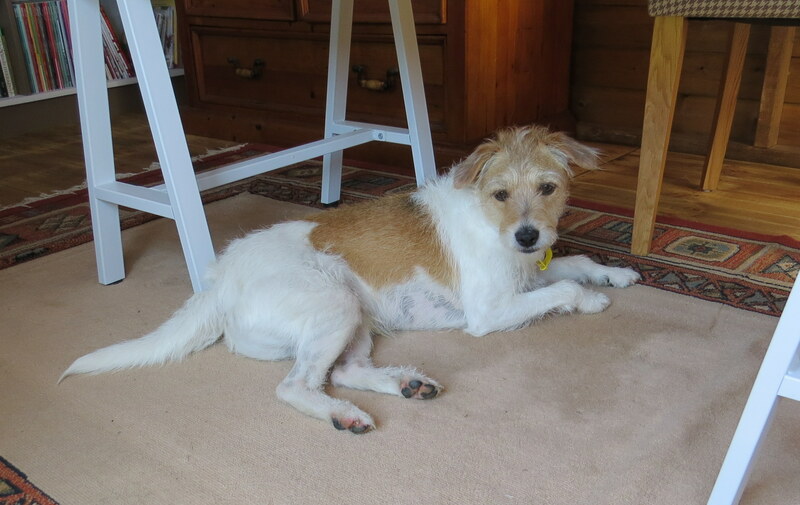 When it gets too hot outside, Finn comes in and lies under the table. 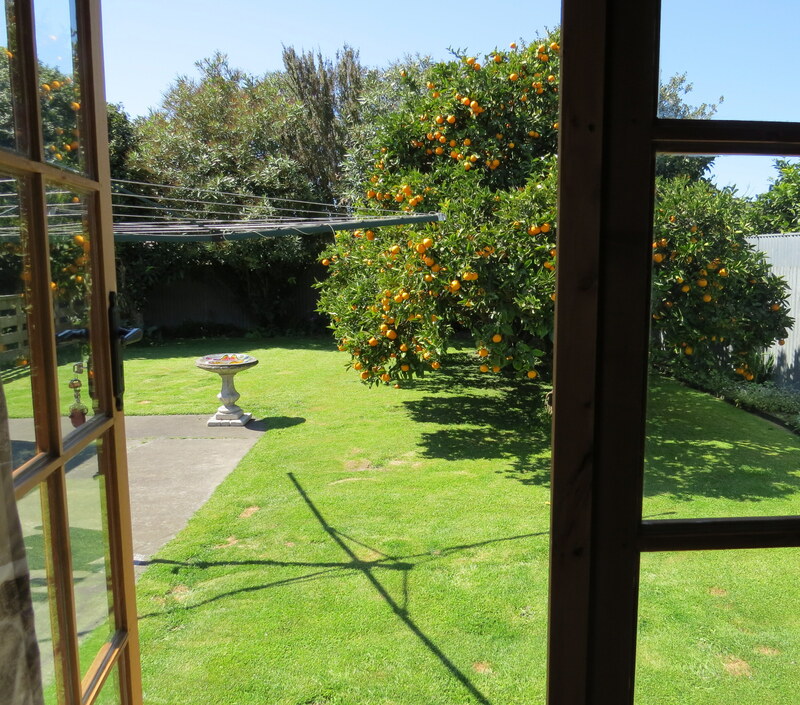 The view from the French doors on this sunny spring morning. 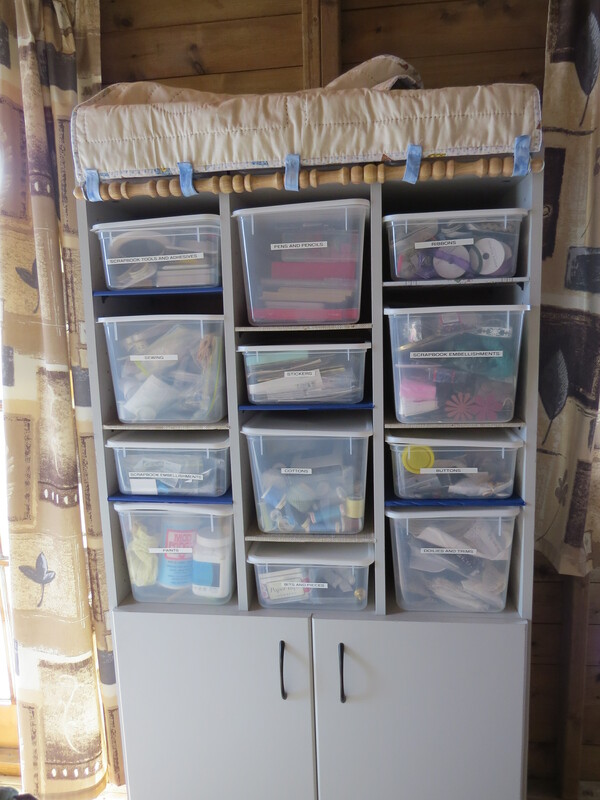 This entry was posted in Craft Studio, Crafts, My Blog, Quilts and tagged craft, craft studio, quilting, quilts. Bookmark the permalink. What a fabulous studio! I want one! Thanks for the follow. I will have to look around more at your site. We have some things in common. Thanks, Michelle! I feel so lucky to have my very own creative space. I am looking forward to following your writing journey. Thanks, Linda! I hope I can keep it as neat and organized as it is now!